Shipping was 3 days late. That wasn’t a huge deal as I wasn’t in a hurry. Packaging was good. Was hard to believe 2 king pillows fitted in such a small box but they expanded when opened. I would say they are about average pillows and priced about what I would find in stores. So far we like them hopefully they will hold their shape. 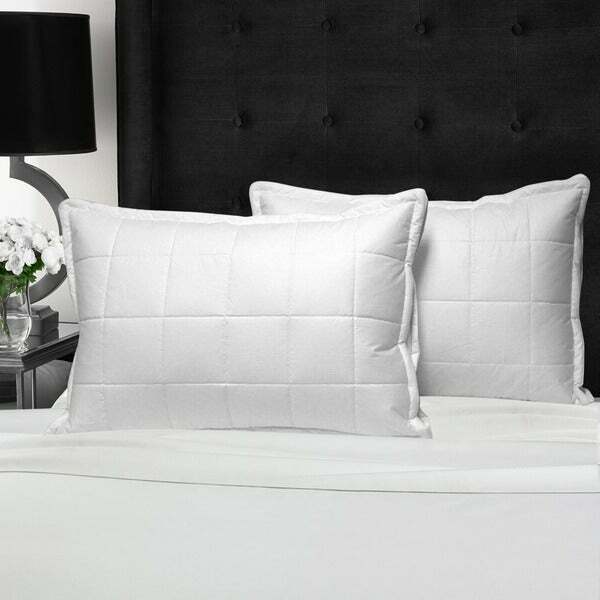 This two-pack of quilted down alternative pillows features 100-percent cotton construction with 233 thread count. Filled with 100-percent hollow siliconized coil fiber with two-inch gussets, this pillow gives you additional neck support for a restful night's sleep. Double sateen piping all around gives it a distinguished accent. These are Great super soft pillows!!! I Would definitely buy them again!! The down alternative is great for my allergies and feels like real down. They keep there shape. I Would recommend!!!! Love these pillows they are the best out there. Would definitely order them again and in fact I did this is my second pair. I just wish I could find this same pillow in the Euro style. Very nice pillows. I was unsure about purchasing pillows online but I would definitely buy again. They sent us USED pillows that smelled like disgusting perfume. Absolutely gross and unacceptable! Returned. Looking for a better pillow . Can't wait to try it.